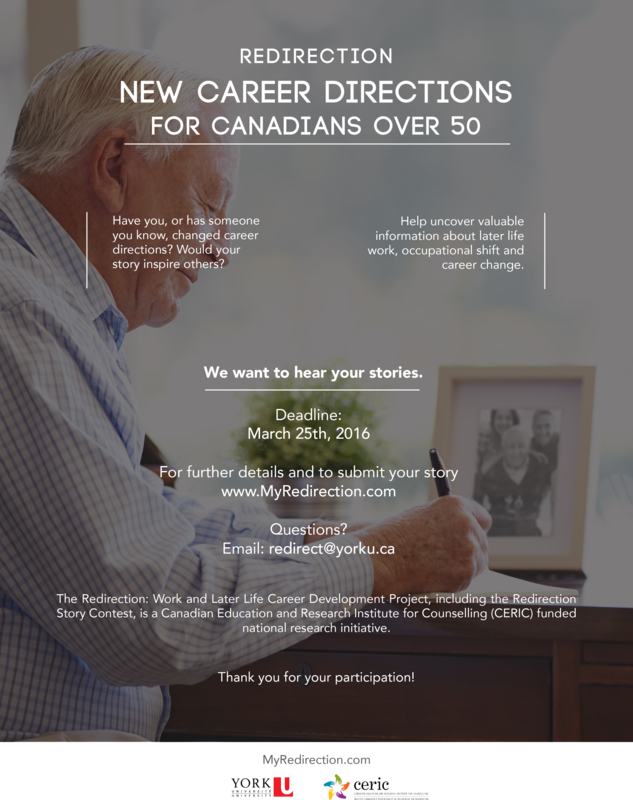 The Redirection Research Project examines individuals’ experiences with later life work and career development as they shift gears and pursue new types of work. 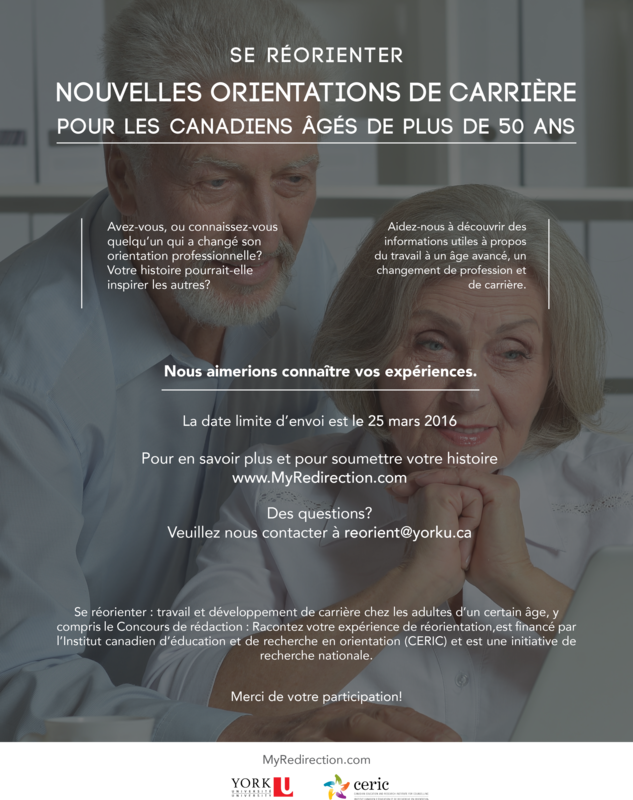 The purpose of this project is to learn more about aging and work experiences. This research initiative will help to develop best practices and create more awareness about this topic in society. The Redirection Project is a CERIC-funded national research initiative. It consists of: 1) a national survey, 2) the Redirection Story Contest (see below for entry form) and 3) a documentary film. To participate in the survey, please see below. The Story Contest has concluded. We received wonderful submissions. Thank you to all the entrants. A random draw was conducted and the prizes were distributed. For updates on the film, please follow us on Twitter: @myredirection and @mareorientation. Thank you to everyone who participated in the Redirection Project. We are excited to share the one minute long trailer for the documentary film. The world premiere of the documentary film was in Montreal, Quebec. The full documentary Redirection: Movers, Shakers and Shifters is now available on YouTube. Screenings have been held in locations from British Columbia to Nova Scotia and places in between. Requests for feature presentations are welcome. The CERIC-funded Redirection Project is complete; however, please contact me via my contact page if you want to share your career story for the forthcoming book about redirection. To participate in the national survey, please click on the sentence below that best describes your current situation. Read the full Contest Rules here (available in English and French). Le projet Se réorienter se porte sur les expériences de travail plus tard dans la vie et du développement de carrière d’individus qui envisagent des changements et poursuivent de nouvelles carrières. L’étude Se réorienter est financée par le CERIC et est une initiative de recherche nationale qui comprend 1) un sondage nationale, 2) un Concours de Rédaction et 3) un documentaire. Le Concours de rédaction est maintenant terminé. Nous avons reçu d’excellentes soumissions. Merci à tous les participants. Un tirage au sort a été effectué et les prix ont été distribués. Pour les mises à jour sur le film, suivez-nous sur Twitter : @myredirection and @mareorientation.